Push down slightly on the top of the stamp and push the locking buttons on either side of the stamp. This will allow the ink pad to slide out. Carefully slide the ink pad out. The inked side of the pad will be on the bottom,take care not to get ink on your fingers. Place a thin layer of ink across the surface of the pad. For best results, allow the ink to saturate overnight. Refill Only With Same Color Ink As Your Original Stamp. 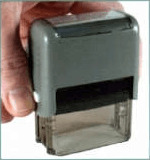 An advantage to self-inking stamps is that you can change the impression color by simply replacing the ink pad with a different color pad. We recommend you not mix colors of ink. Different ink formulas may cause impressions to be blurry if ink colors are mixed. IMPORTANT NOTE: Only ClassiX®, IDEAL®, TRODAT®, 2000+ Ink®, or regular rubber stamp ink should be used to re-ink these self-inking stamps. Use of oil based, numbering machine, Ultimark, iStamp, or Xstamper® inks will cause irreparable damage to stamp(s).